I am regularly asked by customers whether they should be looking at porcelain or ceramic tile when it comes to choosing tile for their kitchen or bathroom. My short answer is to choose whatever you like. Fall in love with a tile and go for it. Ceramic tile is made up of several clays mixed with various minerals and fired at a relatively low temperature. The result is a porous material that is typically glazed with a hard coating that decreases or eliminates its porosity and protects it from staining and scratching. Porcelain tile is also made up of clays and various minerals but also has key components mixed in with the clays and minerals to naturally increase its strength and density and reduce its porosity. In fact, porcelain tile is defined by its low rate of water absorption. If a tile meets a certain criterion for low absorption rates it is, by definition, a porcelain tile. If you find the above information intriguing and you can’t seem to get enough of it, then please follow this link https://www.tcnatile.com/faqs/59-porcelain.html to the Tile Council of North America’s website to discover more fascinating facts that may or may not put you to sleep. What do these differences mean for the average homeowner? Not that much in my opinion. 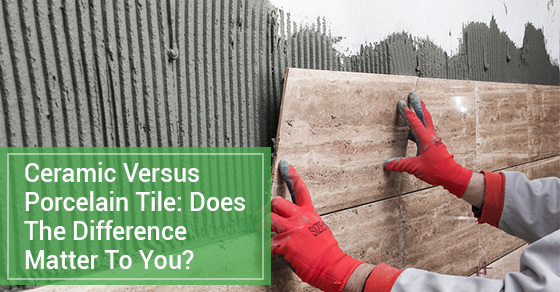 While porcelain is a stronger and less absorptive tile, the question then becomes are these differences important in residential applications? Either porcelain or ceramic tile will last many years with proper care. We have installed both ceramic and porcelain tile on a regular basis and neither of them have given us any problems relating to their inherent characteristics with over 20 plus years of installing them. You don’t necessarily need the strongest, least absorbent tile so buy what you like. There are many ceramic tiles that are produced in shapes and colours that you just can’t get in porcelain and the reverse is true as well. I wouldn’t get too worried about whether the tile is porcelain or ceramic once you have found what you like. Just buy it. Lastly, I will cover off on a few other differences between the tiles. Porcelain tends to be more expensive than ceramic. It will also come in larger sizes which is a bit of a trend right now. Ceramic tile tends to be made in the styles and shapes that were used decades ago and are often most appropriate when looking for a traditional look in your kitchen or bathroom. Think octagonal floor tiles and subway tiles. These both tend to be ceramic. Porcelain can mimic natural stone in amazing ways to the point where it is virtually impossible to tell if it is natural stone just by looking and feeling it.